2017 Outstanding Staff Award winners. Photo by Dana Rogers. 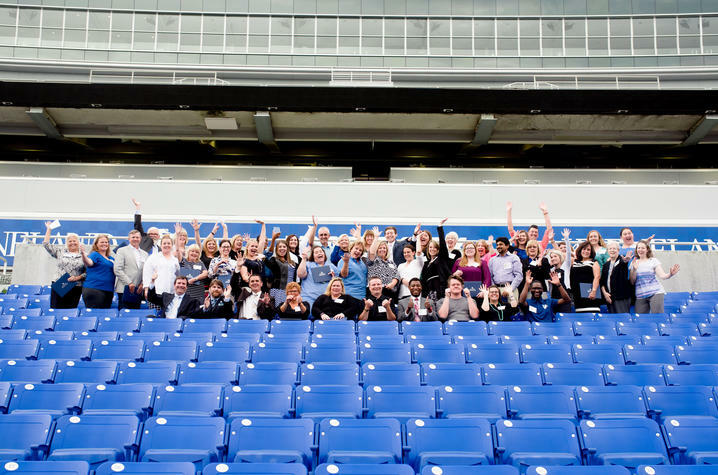 LEXINGTON, Ky. (Aug. 27, 2018) — The ninth annual University of Kentucky Outstanding Staff Awards (OSA) ceremony will be held Tuesday, Oct. 16, 2018, in the Woodford Reserve Club at Kroger Field. Submissions and nominations for recognition are being accepted now. The Office of the President and the UK Staff Senate sponsor OSA to recognize the professional accomplishments of staff across the university and the work of their colleges and units. Individuals who have been designated as outstanding staff of the year in their respective areas will be honored by President Eli Capilouto, Staff Senate Chair Jon Gent and others. If you or someone from your area won an award this year from your college or division, please click here to register for the OSA ceremony by Sept. 21. In addition to the college and division awards, three special awards will be given to staff members across the university. a staff member will be honored by the Staff Senate. If you are a student or faculty member and would like to nominate a staff member for an award, please click here. The nomination deadline is Sept. 21. Official invitations will be extended in the fall to honorees and other special guests. For questions regarding the OSA program, please contact Jon Gent, program chair, at Jon.Gent@uky.edu or 859-323-6540, or Denee Wilson, program vice chair, at Denee.Wilson@uky.edu or 859-257-9242.